Josephine Hardy said she's threatened with being displaced from her home of 47 years. Oakland Councilmembers Dan Kalb and Noel Gallo want to dramatically expand the number of rental housing units in Oakland that are covered by the city's eviction protection law. At today's meeting of the city council's Rules and Legislation Committee, Kalb and Gallo introduced a ballot measure that would eliminate what tenant activists call a major "loophole" in the protections known as the Just Cause Ordinance. Currently, a landlord must have a cause to evict a tenant. This can include not paying rent or continued violations of a lease's written terms after a warning. But tenants residing in duplexes and triplexes are not protected by these just cause rules if their landlord occupies one of the units in the building. Kalb and Gallo's ballot measure, if adopted by voters, would do away with this exemption. 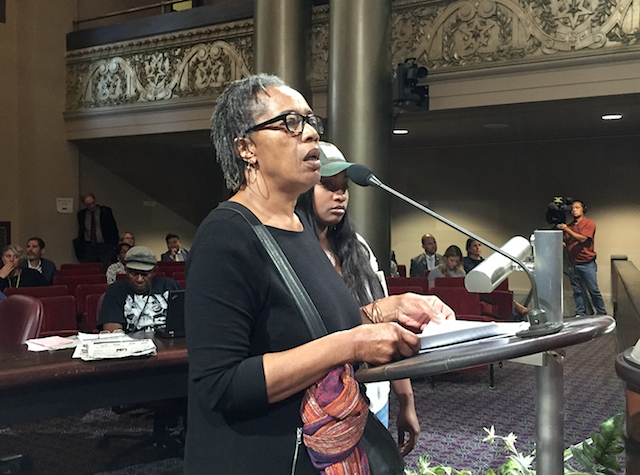 Tenant attorney Leah Simon-Weisberg of Centro Legal de la Raza called the exemption the "biggest piece" of Oakland's housing laws that need to be reformed in order to stop displacement. She said that as many as 8,000 more apartments could be protected against no-fault evictions. Several tenants shared stories at today's committee hearing about how they've been harmed by the current law. Josephine Hardy said that she's been living in a triplex since 1971. It's where she raised her kids and grandkids. But a new owner moved into one of the units and is now seeking to evict her family, she said. She believes her landlord's motivation is to make a higher profit off the building. Landlord organizations have said during previous hearings that the rule is necessary in order to protect smaller "mom and pop" property owners who don't have as many resources as larger corporate landlords. These smaller owners need greater flexibility to manage their properties. But tenant attorneys say the rule is more likely to be used by property owners to displace renters solely to earn higher profits. A recent KPIX investigation found some evidence of this: Realtors in Oakland have advertised duplexes and triplexes based on the strategy of using the owner-occupancy exemption to push out tenants purely so that rents can be substantially increased. Shallyn Wells, an attorney with the East Bay Community Law Center, shared the story of her client, Samantha Lao, at today's committee hearing. Lao lives in the upper unit of a duplex. Her downstairs neighbor left after a new owner purchased the building and evicted them. The new owner now claims to be living in the bottom unit, but Wells claims that this isn't true, and that instead the landlord is simply using the exemption to get rid of Lao and increase the rent. Salvador Sotelo's landlord also tried to use the owner-occupancy rule to fraudulently evict him. Sotelo, a West Oakland resident, won his case against the landlord by proving he didn't reside in the building. But now there's nothing to stop his landlord from actually moving into the duplex and proceeding with another eviction. In addition to getting rid of the duplex and triplex owner-occupancy exemption, the proposed ballot measure would also give the Oakland City Council the power to add additional eviction defenses to the Just Cause Ordinance. Currently, only voters can add defenses through ballot measures. Existing defenses against eviction include failure by landlords to notify the rent board when they evict a tenant, and improperly informing the tenant why they are being evicted. The rules committee voted to advance the ballot measure to the Community and Economic Development Committee meeting on July 17, where it will be debated. The full city council will have to approve the measure in order to place it on the ballot.